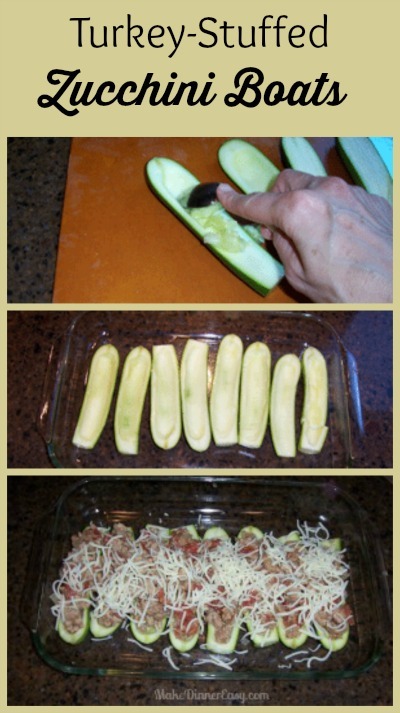 My friend Dana gave me this idea for Turkey Stuffed Zucchini Boats years ago. I love it because it's delicious and it's one of the few ways I can get my kids to eat zucchini! Since she is one of those great cooks that never measures, I've added specific measurements to her recipe. This dish can be made earlier in the day and then placed in the oven 30-40 minutes before you want to serve dinner. Any leftovers you have are also great for lunch the next day. 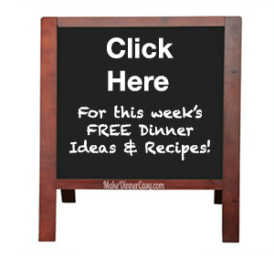 If you have zucchini in your garden or want to take advantage of summer zucchini sales, this is a great recipe to try. Heat the olive oil in a large skillet and sauté the onions and garlic. Add the ground turkey and continue to cook until the turkey is browned and fully cooked. As the turkey is cooking, make sure to break up the meat into small clumps. Meanwhile, cut each zucchini in half lengthwise. Using a spoon, scrape out the center pulp of each zucchini half. Discard the pulp. Place the zucchini halves, with the hollowed out portion facing up, in a rectangular glass baking dish. When the turkey is browned, remove from heat and add the beaten egg, breadcrumbs, seasoning and drained diced tomatoes. Spoon the turkey mixture into each zucchini half. Sprinkle with mozzarella cheese.Bake at 350°F for 25 minutes covered with foil and for an additional 5 minutes uncovered. These can be made several hours in advance and refrigerated. The cooking time may need to be extended additional 5 or so minutes so that the boats are hot and bubbly. Want to Save this for another day? Pin it for later! See it in action! 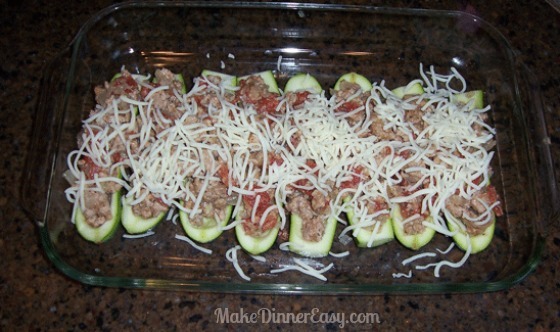 A video on how to make these Turkey Stuffed Zucchini Boats!